A huge heartfelt thank you to everyone who was involved with our wedding. I for one underestimated the immense amount of work that goes into planning a wedding, and we couldn’t have done it without the help of family and friends. Apologies for the long delay in getting these out…I guess that’s what happens when two expert procrastinators get married. Plus we just bought a house. We wanted to create a linocut print as an expression of our appreciation to everyone. We decided to carry on the theme of birds. 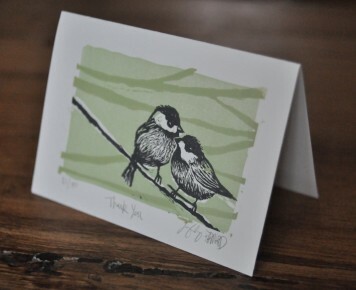 Tara sketched and carved the chickadees on the branch, I carved the background plates and we both printed the cards on my Vandercook proofing press. Hopefully everyone has received their card in the mail by now (if you didn’t, please drop us a line). Have a look at the slideshow below for a glimpse into the process or view the album full screen. I love the card…thanks for sharing the making of it with us. You two are something else. True artists in every sense of the word. What will be next? I can hardly wait for the “baby stuff”… do we get a glimpse of the artist’s “conception?” (pardon the pun…I’m dying laughing at my own joke). It was great seeing you at the Grey’s on Saturday. By the way, did you two win the prize for best sixties costume on the 26th? WOW !!! you two certainly know how to say Thank You….. Your keepsake Thank You card is the perfect artistic finishing touch to a Wedding Celebration filled with “the personal touch” Keep the talents flowing….